"Antiquity Echoes: A Photographed Tour of Abandoned America" December Book Giveaway ~ The History Girl! 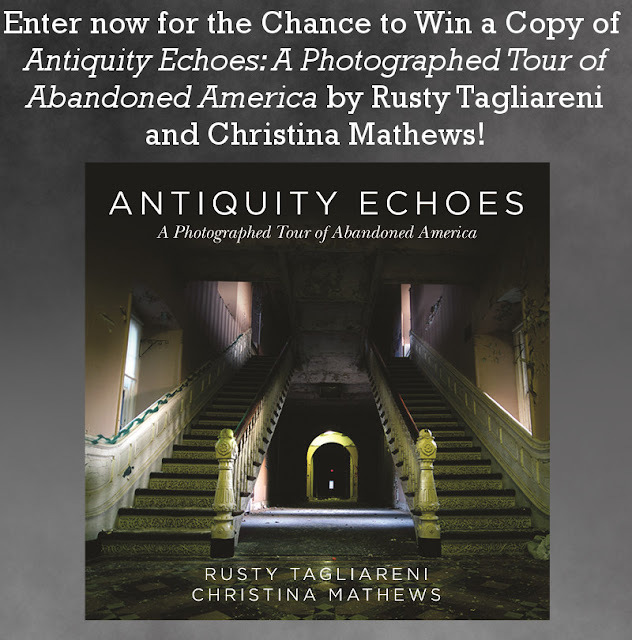 Thanks to Skyhorse Publishing and authors Rusty Tagliareni and Christina Mathews, The History Girl is offering one copy of their book Antiquity Echoes: A Photographed Tour of Abandoned America. In order to be in the running, submit your name and e-mail address below! This contest has ended. Thanks for all who participated! Purchase a copy here. Antiquity Echoes is a guided tour of some of our nation's most compelling abandoned locations. With a wide spectrum of places covered, readers will be walking the dark halls of an abandoned mental asylum on one page and lost in the overgrowth of an abandoned theme park on the very next. With a focus on history and first-hand accounts by the authors, Antiquity Echoes is far more than a collection of photography and text; it’s an adventure story - one that is enhanced by QR codes linking to videos of these incredible locations. Rusty Tagliareni and Christina Mathews have spent years traveling the country documenting forlorn locations throughout the United States, sharing their deep passion for history and preservation in an effort that has helped generate alliances with many historic societies and preservation organizations. What makes a place worth remembering? Antiquity Echoes ventures that this value derives from the lessons a place can teach us, even long after it has been of use. No matter how forgotten a place has come to be, underneath the overgrowth, cracked paint, and filth of ages, lie countless stories awaiting a sympathetic ear. *One entry per person. *Valid for all residents of the 50 United States of America, 13 years of age or older. *Entries without a valid e-mail address are not eligible. *Contest begins December 13, 2015 at 6:00 pm EST and ends December 19, 2015 at 8:00 pm EST. *The winner will be chosen at random. *The winner will be notified via e-mail on December 19, 2015 after 8:00 pm. The winner must respond with a mailing address within thirty-six (36) hours or another winner will be chosen.